1. Watch the short clip I created (embedded below or linked here) on the key theory of autonomy that I draw on in my work on student experiences of flipped classrooms. We will use this as a basis for some of our discussions around classroom practice. If you want more details on the theory, you can see my blog post here. 2. Read Dan Meyer’s blog post on the painted cube problem (found here) and consider how cognitive autonomy is being elicited by his approach. 3. If you still have time, think about what sorts of activities you can think of using in your classroom that give room for cognitive autonomy. I look forward to seeing you at my session! See you at CanFlip14! 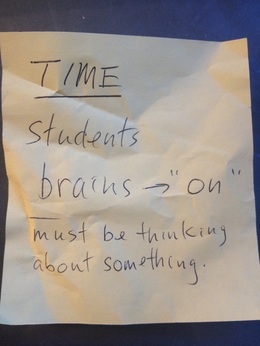 I was cleaning out my car yesterday, and I found a slip of paper from the ETUG presentation that someone had written on in response to my question of what teachers SHOULD be doing with class time. Yes! Students often come with the expectation that they will be told everything and that they will figure it all out when they leave. I know I used to think this way! However, class time could be used so much more efficiently if students did the figuring out part during class instead of out of class. This is essentially the concept of a flipped classroom. As I am just wrapping up my masters thesis on experiences of a flipped classroom, I am drawing more and more attention on analyzing the autonomy that students are provided in class and how that either motivates them to learn or motivated them to slack off. In my research, I have found that autonomy can be classified into procedural, organizational, and cognitive autonomy. This classification is introduced by Stefanou, Perencevich, DiCinto, & Turner (2004) as shown below. Stefanou et al. (2004) found that cognitive autonomy support was essential in student engagement. Further, Jang, Reeve, & Deci (2010) determined that not only is cognitive autonomy essential, but it should be paired with teacher provided structure. Structure, as defined by Jang et al. (2010), is a way of maintaining control over the procedural and organizational dimensions in an autonomously supportive manner. This means that teachers should provide guidelines for these dimensions in order to maintain student engagement in course content. This is not to say that these dimensions should be controlled in a controlling manner, but rather in a manner that leaves room for student input. My current research has provided further evidence of the importance of cognitive autonomy in student engagement and how it is most effective when organizational and procedural dimensions are structured in a student friendly manner. The implication here is that flipped classrooms should not be seen as ways to allow students to do anything they like. The role of the teacher as a facilitator rather than a dictator is absolutely crucial in fostering student learning. In essence, fostering student learning should be the number one goal of teachers. However, with a variety of external pressures, it is understandable that it is a difficult goal to pursue. My research has also provided evidence that not all students desire a deeper understanding of the material. These students may not engage in meaning making activities no matter how interesting they are. However, providing opportunities for developing deeper understanding and eliciting cognitive autonomy in students allows those who strive for understanding to be able to attain it. So, what will we do next to try to turn our students’ brains ON? Jang, H., Reeve, J., & Deci, E. L. (2010). Engaging students in learning activities: It is not autonomy support or structure but autonomy support and structure. Journal of Educational Psychology, 102(3), 588–600. Stefanou, C., Perencevich, K., DiCinto, M., & Turner, J. (2004). Supporting autonomy in the classroom: Ways teachers encourage student decision making and ownership. Educational Psychologist, 39(2), 97–110.